I have posted this before somewhere on here, I have been involved in (3) 4.440 x 4.500 flat top, zero decked, solid roller engines. With an out of the box P-51 heads, ported Victor intake, Q-16 fuel 1250 Quick fuel, one inch 4 hole to open Jomar spacer, 2.250 to 2.375 stepped 28 inch header with a 4.5 inch collector. All three engines built exactly the same all made within 5 hp of each other, 900-905 hp @ 6900 rpm. Fairly simple builds, nothing exotic about them. IDT-572 wrote: I have posted this before somewhere on here, I have been involved in (3) 4.440 x 4.500 flat top, zero decked, solid roller engines. at the price they go for that is pretty awesome for out of the box in my opinion. I did a '69 Mach1/514 deal with stock towers years ago. Access to plugs was enough of a pita that we used a hole saw through the aprons and towers to reduce the use of dirty words. We filled the holes with plastic body plugs. After that, it was a simple matter of taking off the front wheels and popping out the plastic plugs in order to do the job without hyper-extending my vocabulary. looking at that dyno chart makes me wonder why 3 heads all have a flat spot and drop off in about the same rpm range,and the afr heads have a nearly perfect arc? could it be they used a stock out of the box unported or port match Victor on those there heads,and there own afr intake on the afr heads? those 3 heads would all benefit from at least a port match at this hp level.I am sure that pro builders would ask that question before taken there test as fair.ask if they used the same Victor on all 5 head test. I would like to know.all of those heads are high quality products,and have proven themselfs for years. I'm more Interested in track performance. I'm no expert but have seen great increase in bowl ported SCJ and picked up I beleive 40 cfm at like .450-500 and a 60cfm gain before stock head fell off and wasn't going to compare no more. Anyway picked up a easy 75 HP without touching port or cross section. My main goal was to get air speed up. That said and seeing what probe read before and after I would have to Go with AFR with the smaller cross section and comparable flow. Building a huge motor wouldn't matter as much. Dynos don't seem to factor in how the motor will cause converter to react., specially foot braking. That SCJ motor made tons more torque and picked up 4 tenths down to 5.80s. All the tracks within a hr. are 1/8 mile where torque is King. Would love to see results from a probe and airspeed FPS. Or atleast compare Min. cross section of both heads. I believe after testing the SCJ ,I know the P51 head will have a big MCS. Be nice if someone measured and figured average air speed on for Both andc posted and see what PipeMax says For a 514-557 engine. Lets start with a set of A429 heads ported - 395 CFM @ 0.800"
MCA measured at 3.7 square inches. Minimum was about 1" into port. If I had to do these over again I would fill the floor and reduce CSA which would bring up airspeed in the port itself, and one would be able to get a decent taper into the victor intake with a smaller exit CSA. A filled port (clay filled bottom) was tested and there was very little impact on flow numbers. 68galaxie wrote: Great idea ED468. That is a HUGE cross section for anything under 600ci, especially only making peak in the 6500 range. For instance; a 4.44 x 4.50 engine making peak @ 6500 only needs 2.94 sq in min, but needs 3.39 sq in valve throat which is a 2.3" valve @ 91.5%. A 4.6 x 4.5 engine at the same 6500 peak only needs 3.16 min but needs 3.64 sq in valve throat which is a 2.39 valve @ ~91%. Move that engine to 7000rpm peak and the cross section goes to 3.4 but now the valve wants to be 3.9 sq in which is a 2.46 valve @ 91.5% (or a slightly smaller valve at a larger throat percentage). This is all based on having a minimum restriction in the port. 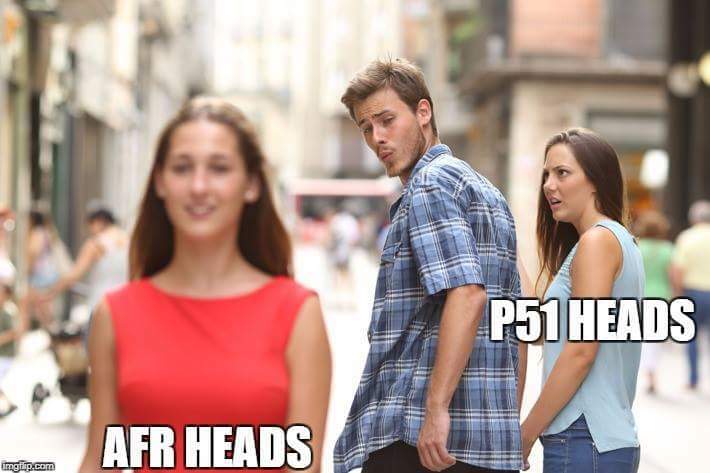 I agree the CSA is too big - as many BBF head offerings are at 500 ci inch and less. This is still smaller than the iron 429 CJ heads they were designed to replace. One also must not look at theoretical min CSA numbers for low port cylinder heads. Low port heads need a little larger CSA than a high port cylinder head. One must take the port design and layout into consideration. untouched as cast - more in the bowl area and short turn work. Yes the valve throat is the minimum choke point on these heads - as they are on P51's and most other BBF heads. Simply cannot get a 2.25" + valve size on the A429 (unless one moves the valve locations) The valves will touch with a larger cam. Some head porters prefer the minimum to be at the valve seat. Others do not. On the pre 5000 serial numbers, what you say is correct. But I will still do a 2.250 intake and a 1.71 exhaust and do a 50* valve job and make the throat as big as possible to make up for the loss of diameter. Don't get hung up on exhaust flow numbers, just make it big as you can in the throat and bigger as you go to the port exit. Then let the cam give it enough time to get out, and a little extra to tug on the intake port during overlap. 68galaxie wrote: I agree the CSA is too big - as many BBF head offerings are at 500 ci inch and less. I'm not a proponent of small cross sections. I AM a proponent of a minimum cross section in the port before the valve and very specific air speeds, ESPECIALLY in low port architectures. They don't arbitrarily want more cross section. Some porters understand this, some just have an opinion based on what others do. It's all about the architecture of the port. Raised runners with a straighter shot and less intersection angle between the valve and port... they can stand to have the valve as the minimum but even then I question whether or not a properly designed port with a minimum upstream of the valve would work as well, or better. Some very high speed, very efficient ports have been designed this way like in F1 for instance. BUT..."theoretical minimum cross sections" still apply and whichever you choose, the valve needs to be what it is. Of course, there are those who will argue this as well and say the valve can't be "too big". There are head/engine combinations in the industry that work very well which fly against the "theoretical" velocity formulas for valve size. The Chevy LS motor is a perfect example but there, you have the benefit of a completely computerized engine management system and a modern design. With a carb, naturally aspirated, on gas, basically old school like we're dealing with here, I believe in controlling the velocity as best as possible. I believe the AFR head has about the smallest cross section. The 315 head has a 3.44 cross section with a 2.30 valve. Depending on the throat on the 2.30 valve, that makes the port almost "straight" to the valve. The 280cc head has a 3.22 listed as a minimum. Persoanlly, I would start with that head and put the biggest valve in it I could, get the flow numbers as good as they could be and that would be a really really good head on a moderate BBF build. IDT-572 wrote: On the pre 5000 serial numbers, what you say is correct. But I will still do a 2.250 intake and a 1.71 exhaust and do a 50* valve job and make the throat as big as possible to make up for the loss of diameter. The next time the engine is apart I will reduce the exhaust valve to 1.71" and put a larger intake valve in. Sinking the valve job will also create more valve to valve clearance. I may also fill the floor - this will get to CSA of appx 3.5 square inches, maybe a little less. Should work better for a smaller displacement. 68galaxie wrote: I agree IDT-572. If you perform a 50 degree valve job on the exhaust side as well, it won't sink the valve hardly at all when reducing to a 1.71" diameter valve. Here is a Fairmont with a set of AFR's, which ones I don't know. I've gone over the video and the motor seems to be NA or a pro charger equiped. I could be wrong though. 170 MPH trap speed seems respectable for an Old Lady riding in a shoe box..... Here's a 1320 video. XF-66 wrote: Here is a Fairmont with a set of AFR's, which ones I don't know. I've gone over the video and the motor seems to be NA or a pro charger equiped. I could be wrong though. Your right, my bad. Think I need glasses. lol! You want to make X amount of horsepower, so use a head that will allow that. Who cares who's name in on it? Mark O'Neal wrote: I don't quite get it. And how do you go about figuring which head that will be? Heads are kinda like engines. Even though they all have valves, ports and combustion chambers, they all have their quirks and idiosyncrasies. I agree that the name means nothing other than being able to identify those differences. On paper, all these heads may be able to make about the same power based on cross section, valve size, flow numbers, etc. but trust me; on the engine, they won't. My hero Ben Franklin once said; "Good judgement comes from experience and , experience ... well, that comes from bad judgement".